Founder and Artistic Director Margaret Ann Pent and President and CEO Parban Bakardiev celebrate 10 years of leadership in Wichita as the WGO kicks off its 10th Anniversary season on January 8. 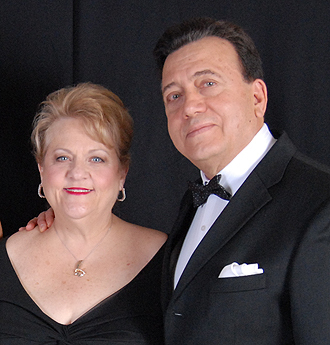 (Wichita, KS – January 6, 2010) Wichita Grand Opera’s Founder & Artistic Director Margaret Ann Pent and President / CEO Parvan Bakardiev were honored at OPERA America’s 2010 Conference in Los Angeles, California, with OPERA America’s Bravo! Service Awards “in recognition of ten years of leadership”. OPERA America’s Bravo! Awards were established in 1996 to recognize extraordinary accomplishments on behalf of opera among professional companies, media organizations, corporations, artists, and educators. Nominations are submitted by Professional Company Members of OPERA America, with winners chosen by an independent panel. OPERA America’s membership includes 119 professional opera companies in 42 states across the country. Ms. Pent and Mr. Bakardiev, both graduates of the University of Music and Dramatic Arts in Vienna, have achieved many firsts in the course of their careers. Their productions have included: the first Salomé triple-bill of Strauss’ opera, Peter Maxwell Davies’ ballet, and Oscar Wilde’s play; a similar triple-bill of Carmen, including the American premiere of the ballet Carmencita; the first American production of William Tell in over 50 years; the American premieres of Benjamin Britten’s opera Gloriana and the ballet The Three Sisters. These productions included the American debuts of the Berlin Opera, English National Opera, and the Royal Swedish Ballet, among others.